We've produced 2 Information Sheets which cover the issues involved with the Mental Health (Wales) Measure which you can view and download below. 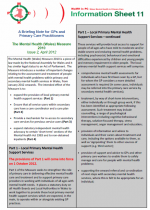 Information Sheet 6 was published in June 2011 and while Information Sheet 11 was released in April 2012 and both provide information for GPs and mental health professionals about the various implications of the Measure. Their publication comes under the set objectives or our Gold Standard Project which has set the goal of providing good communication on mental health issues at the heart of its work. In line with this aim, we've also produced a number of other Information Sheets on a variety of other mental health subjects which you can view on and download from our Information Sheets page.